What a stunner Oxalis triangularis is! We’re absolutely captivated by their uniquely colored leaves of deep maroon-purple and unusual trifoliolate foliage! Small clusters of light pink to lavender flowers borne above the lovely foliage display a wonderful contrast too. It is truly impressive! In fact, we did plant Oxalis triangularis which we named Butterfly Leaves about 3 years ago. Unfortunately, in less than 3 months it just died suddenly, which we attributed to root rot. We must have over watered, thinking that the plant was thirsty when its foliage folded down – how ignorant! Hopefully now, with added knowledge from researching the internet, we’ll know how to care for these lovelies and they’ll stay happy and healthy forever. Plant type: An ornamental annual or perennial plant, native to Brazil, South America. Light: Filtered sun to light shade, preferably with morning sun and afternoon shade. Tolerates shade, but produces best foliage color and flowering in bright indirect light. Moisture: Moderate water requirement during active growing, but water sparingly during dormant periods which most bulbous, rhizomatous and tuberous plants undergo. Water directly onto soil as it does not like wet leaves. Propagation: By division of vegetative offsets from matured clumps or by rhizomes (bulbs). Plant the bulbs about 1-2 cm deep in moist potting mix and set it at a sunny spot. Water sparingly in the beginning and increase gradually but do not over water to avoid rotting. Plantlets will sprout in about 6 weeks. To get more plants from a single rhizome, just break it into smaller pieces and plant them sideways if unsure of which side of the broken piece is up or down. Features: Oxalis triangularis is a low growing clump-forming herbaceous plant that reaches a height of 7-10 inches with a spread of 10-15 inches. It forms clumps rather quickly and bears velvety heart-shaped trifoliate leaves like the Shamrock’s foliage, and are fabulously hued in dark maroon-purple with a central blotch of wine-red on each leaflet. The plant is thus called Oxalis triangularis, as an obvious reference to the three-sided leaves that are borne in clusters of 3 and held at tip of slender succulent stems, that can arch downwards due to the sheer weight of the leaves. The clove-like leaves will fold down from sunset till the morning light and even during times of water stress, extreme heat or wind, which is a characteristic of Oxalis. Clusters of dainty, light-pink to lilac or lavender flowers that are funnel-shaped, are borne above the mounds of foliage, creating a stunning contrast. 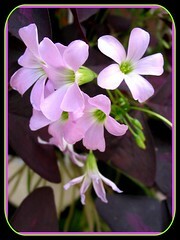 Usage: Oxalis triangularis is popularly grown indoors as a potted houseplant or in green houses. 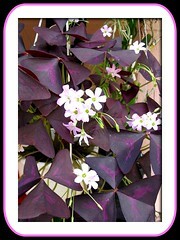 In fact, it is the only Oxalis that does relatively well indoors. It is ideal to be grown outdoors too in hanging baskets or mixed containers at porches, patios and decks, or on ground at front of garden beds and borders, even shaded beneath shrubs in woodland garden. Its leaves, flowers and roots are edible, but beware that consumption of its leaves in large quantities is detrimental as they contain oxalic acid. Care: Best way of cultivating Oxalis triangularis is in pots or containers. Provide lots of light or sunshine all year round, as it requires excellent light to prevent etiolation. Water moderately and feed lightly during its growing periods, but withhold them during dormancy. Get to know more from other oxalis gardeners at Dave’s Garden. 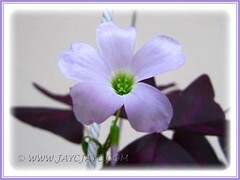 Oxalis Images: From Pacific Bulb Society and International Bulb Society. spp. Birgit : green leaves, pink flowers. spp. Cupido – beetroot-red leaves, pale pink flowers. spp. Fanny – mottled green leaves, pink flowers. spp. Francis – bright maroon leaves without markings, pinkish lilac flowers. spp. Gin-no-mai – blotched green leaves, light pink flowers. spp. Irish Mist – speckled green leaves, white flowers. spp. Marmer – blotched green leaves, white flowers. spp. Mijke – bright, burgundy-red shamrock leaves with red markings, pale pink flowers. spp. Papilionacea – green leaves with undersides flushed burgundy, pinkish white flowers. spp. Papilionacea ‘Atropurpurea’ – burgundy-maroon leaves with red central markings, pink flowers. spp. Sunny – bright, burgundy-red leaves with darker margins, pink flowers. spp. Triangularis – dark maroon-purple leaves with a central blotch of wine-red, light pink to lilac or lavender flowers. There are a few species out of the many (about 800 species) in the genus Oxalis that are classified as invasive weeds in the United States, such as Oxalis pes-caprae, Oxalis corniculata and Oxalis stricta. Update: 20090301 – More recent photos here. Dear Jacq, after much pain searching “high and low” on the internet, I had finally found the name of this pretty and rare plant bought from the nursery !! 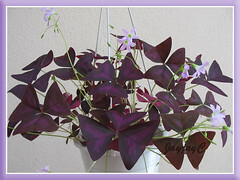 Oxalis Triangularis or Love Plant, it is so called !! (The aunty at the nursery told me it is called “butterfly plant” but a search on the internet actually showed me Christia Vespertilionis, which was different). I am even more delighted to find that you have Oxalis T under your website. Thank you for sharing your knowledge on growing this plant , and also the useful links to other experts specialising on this plant. I had a pot which withered under my ignorance (overwatering and spraying of of water directly onto the leaves, the stems looked eaten up by some whitish fungus at the soil level). I saved 2 clumps and repotted them. 1 clump looks healthy, the other clump looks withered, question: shall I cut off the stems of the withered clump and leave the root inside to see if it multiplies? Wish me luck ! Hello Tanya! Thanks for visiting and penning your thoughts and appreciation. I’m happy that you’ve found the information useful. Hmm…I can relate to your Oxalis experience as we too lost our first pot of Oxalis. As for the present ones, they are still surviving, going into their 6th month with us though not as vibrant – maybe need to repot…or are they going into dormancy? Too soon to tell as we are still experimenting. Probably they’re like the Caladium that offshoot from tubers too after a dormant period. So, I would agree with your idea of cutting off the withered stems and let nature take over. Hi, I have several varieties of oxilis in my garden. One plant is about 18 years old. They get about 2 hours of direct sunlight (11 to 1). They are full and are blooming. My problem is this ..one of the Shamrocks has some rusty coloring around some of the leaves and the 2 dark leaved ones have many small holes and rusty colored spons on the leaves making them unattractive. Could the problem be that the sun is burning the leaves? I water about 2-3 hours before the sun is on them but the water does not always evaporate before then. Do I need to fertilize? Hello Bette! Wow…amazing to read that one of your oxalis plant can survive for 18 yrs! With regards to your enquiry, hope someone out there who has more experience with oxalis can provide you with the right answers. In regards to Bette’s message, she might have already found the answer to her problem, but if not, check out http://hortchat.com/info/shamrocks. It sounds like the same problem that others had. Good luck and I hope your plant is doing better! Hi Prakash! Probably at Easy To Grow Bulbs’ site. I have recently taking a cutting of my very successful oxalis triangularis to France where it is growing nicely in a couple of pots inside. However I noticed on my last visit that it seems to have become ‘French’! By that I mean that the leaves seem to shut down between 12-3pm (even though it is in a bright spot) as if it is taking a ‘siesta’, something my plants have never done in the UK. Can anyone explain why this might happen? Someone gave me an awesome oxalis triangularis. My question is…is it toxic to cats? I’m desperate for an answer. Please email me if you have any good info. Thanks! HELLO CAN ANYBODY TELL ME WHERE I CAN BUY THIS PLANT IN THE UK PLEASE??? Natasha, toooo much sun in your French location they do shut down because that. In California I have them indoor early morning 3 hr direct sun then bright shade, they shut down immediately in hot sun. Proof positive that the definition of a weed depends on human perspectives – this plant is considered a terrible pest and weed that is hard to eradicate in New Zealand where I live… Shift your perspective and oxalis becomes a hardy easy-to-grow plant with lovely foliage and flowers. 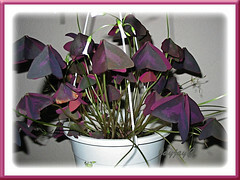 My heart is sad – I have had a ‘purple Oxalis Triangularis’ since 1994 in a great pot – indoors – it has had rough times, but always came back. But not this time. I am desperately trying to locate another – one that is already growing in a pot – not bulbs – but having a hard time. Can you tell me where I could buy one – I live in Portland, OR – but would mail order from anywhere. Hi Beverly! Sorry to read of your loss. Too bad, I’m unable to help out. Hope someone visiting here will be able to assist you in your search, otherwise I think you will have to google further for answers. It’s not silly to be attached to a plant! I have several that remind me of my mother, and I would be very sad to see them go. 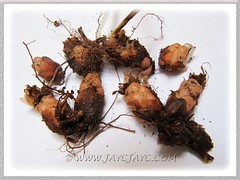 About buying oxalis, it really is very easy to grow them from the little rhizome bulbs, probably cheaper too. You only have to plant them 1″ deep in quick-draining soil, and water thoroughly once-twice a week depending on how hot it is (whenever the pot feels very light, water it). You can plant them close, too; the pot will fill out faster if you do. In about 6 weeks the bulbs will sprout and send up very cute little shoots. You will get flowers within six months if there’s plenty of light, or in the next spring. Hope Beverly Collins gets to read your lovely suggestion of getting oxalis bulbs instead and know how easy it is to grow them, a very practical alternative I think if a potted plant is unavailable. can you break peices off and grow in seperate pots? If you’re referring to the bulbs, yes, you can, Dan! do the flowers seed and if so can the seeds then be planted? I’ve yet to see the flowers set seeds, Dan! Not sure whether they do, though. Hi Christopher – thanks for your comments re: my plants in France – only just looked at the site again nearly a year later – I’ll remember to keep them out of the sun! Clinical Signs: All parts of the plant have toxic potential, although the possibility of serious effects is usually limited to ingestions of large quantities. Consuming Oxalis species can produce colic in horses, and kidney failure is possible if significant amounts are eaten. Thanks, Louise…appreciate your kind comment! For 20 years, when I visited my friend Greta in the UK, I admired her purple clover – big and bushy, it was lovely – and rare! When I went to the UK 2 years ago, I asked her for a cutting. I wrapped it in wet cotton wool, put it in a small water bottle and smuggled it to Menorca where I live. It had to move house twice over that summer and grew little mauve flowers and more purple leaves. It lasted 6 months but finally expired…Well, it probably went dormant, and I planted something else in the pot to replace it! My friends Isabel and Elena in Madrid liked it too, because I named the first leaves after them! Isabel found the same plant at work and stole some bulbs, giving half to me! Well, I planted the bulbs in March and forgot where – I´ve got a million pots! And then in April…it sprouted! Having a talent for killing plants with kindness and care, I´ve sensibly decided to let all the leaves sprout and all the flowers die before I separate the 5 bulbs and repot them – but it´s getting crowded in that pot! Too late! This morning I gave in to the repotting urge and all the leaves and flowers flopped over alarmingly, when I tried to separate the clumps. Wait a minute, 12 hours later the plant has revived…hooray! What a pity I can´t post photos here – I have the whole thing on camera. One question: I know I shouldn´t cut off the leaves yet, but what about the dying flowers? Won´t that encourage more blooming? Menorca tries to keep all their wild plants native, but I am determined to spread this purple clover ALL OVER THE ISLAND! Tomorrow…the world! Thanks for sharing, Betty! I hadn’t known that this plant is also commonly referred to as Purple Clover. I have enjoyed the “Triangularis” for years. A few months ago, I was in the process of re-potting one that withered itself into one lonely leaf. It had a strong stem base but it was the only thing in the pot, While transferring to the new pot, the stem broke off from the bulb (worm looking pod) and I thought I had murdered it. So… I stuck the broken stem in a tall vase of water and set it out on my enclosed porch in the direct sunlight, just to see if it would root. Not only did it root, but it seems to be rejuvenating itself with a whole new pod (bulb). I do not want to move it because not only has it formed a very strong root/bulb system, it is sending leaves up from under the water. 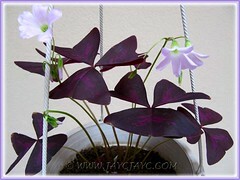 I want to know if growing Oxalis Triangularis hydroponically ever been attempted/accomplished before. this is truly exciting and I wonder if I have stumbled across a new experiment. When we moved to our house in the Dallas, Texas area, the tiny backyard had some “design” features, including a fake mini-waterfall and a raised bed with some small shrubs and a small planting of Oxalis Triangularium (did I spell that right? It’s the purple stuff.) I cut down all the plantings, leveled the bed, tossed the waterfall, and scattered the soil over then yard, then put in a brick-in sand patio. The Oxalis T. has come up everywhere, even between the bricks, and has virtualy crowded out a planting of dwarf mondo grass, with virtually no encouragement. It grows in heavy clay soil, gets watered by sprinklers every day, and draws oohs and aahs from everyone who sees it. I don’t know if it has pread from seeds or from rhizomes, but it has proven to be a totally care-free, durable spreading plant. One of my numerous “accidental” successes in gardening. I am going to try to propagate it on purpose, but I doubt that I can improve on what nature has done. I also finally found out the name of this plant today after about 10 years of having it. I saw it for the first time at my ex mother-in-law’s place in The Netherlandsa and fell in love with it. She gave me few roots which I took to my far homecountry Kyrgyzstan. After it grow I shared it with my mother and few sisters. Two and half years ago I moved to The Netherlands and last year on vacation to my Kyrgyzstan I took few roots back with me. Now I have it growing in my new home. Unfortunately my mother-in-law passed away few years ago and I decided that I will grow another pot if it and give to her husband as a remembering of her. Great to know you’ve nailed your plant’s ID, Venera! Hope your plants give you many more happy memories. Thanks for sharing your experiences here. Am so happy I found the name! As most time I asked the seller, they told me its call butterfly plant! its not easy to find this plant in Singapore. Had successfully grown it for a year then it died. So sad…Few years passed and recently found it at a nursery with a tag and its name. But is still a very young plant. Been caring it dearly and waititng for it to grow up and bloom. We’re delighted for you, Lindy… to have found your plant’s name and got a new plant. May your tlc be rewarded big time! I have been given a wonderful oxalis triangular. I have not idea how to care for this plant. I live in the mountains of Western North Carolina. It get cold in the winter and can get pretty hot in the summer. Can I plant this plant in ground in my area. What temperatures will it tolerate. Does it have to be grown in a pot and taken inside in the winter. Hi Dianne! Sorry, we’re unable to provide answers to your enquiries as we’re in tropical Malaysia. Hope someone reading here will be able to help. Nevertheless, you may want to hop over to Dave’s Garden where many oxalis gardeners in temperate regions have shared their experiences… I’m pretty sure you’ll get your answers over there. Hi Lindy! i’m from Singapore too. where can i get a oxalis? i saw it being grown by my professor in university and i want to get it because it looks so pretty! How is your Oxalis doing now? In the beginning it appeared to be challenging to me. I had planted about 5 pots of Oxalis – just to be on the safe side. One of the Oxalis appear to be disappearing – first signs were the withered leaves. I stopped watering it for 3-4 days and it spring back to life again after the 5th day of watering. I doubt Oxalis go dormant here – if it appear to be going dormant – then quickly uproot the whole thing and check because the chances are the rootmass is getting rotten. I thought it will eventually go dormant – but they seemed to be putting runners and taking more space on the pot. Perhaps – its the watering – too much water kills, and often – it appears the faster you savage and reset the soil – the more you can savage them from root rot. Not good at all, James. It’s now left with just 2 leaves. Though one of them is a new shoot to show that the rhizome is still active, I’m more convinced that it’ll expire soon. Frankly, it’s hardly watered by us but gets showered by the frequent heavy rains that we’re experiencing this month… too much rain showers and insufficient sunlight is killing it gradually. I’ll probably follow your advice to dig out the rhizome and renew the soil or take the easy way out by loosening the soil to improve aeration, relocate it to a sheltered spot and hope for the best. Thanks for dropping by to share your experiences and impart some insights. Where can I buy Oxalis triangularis in Singapore? I love the plant. Its really beautiful. Would any one want to give the bulb? Oops. I didn’t proofread—I meant to say that after dumping my oxalis plant, I just stuck some of the bulbs and stems back into the pot and covered them a bit with the dirt/soil. I am pretty clueless regarding gardening and such, but this plant is obviously easy to take of. Hi Mimi! Great to know you’ve found some answers about oxalis over here. Hope your plant blooms more often to cheer you. Our potted plant has charmed us for many years in spite of occasionally ‘feigning death’! Read about its return to life recently, here. Hi I was wondering if anybody knows where I may be able to get a butterfly plant from? I have looked everywhere for the last few months and everywhere apears to be ou of stock. My nana had a beautiful pink one but I can only see purple but again can’t buy one I would be very greatful for any help. And for those looking in the states, today, March 1 2013, I purchased 15 bulbs at wal-mart(of all places!) for 6.00.